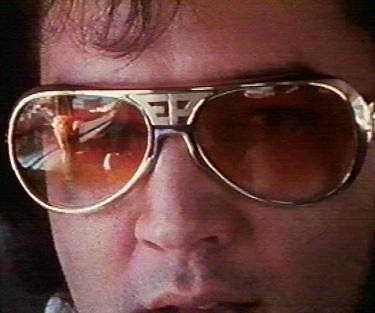 Elvis Enthusiasts Unite: It's good to be King. And, for Elvis' 75th birthday ... which is TODAY, folks ... I somehow wound up on CNN, snarling at the camera in my Elvis getup. No, really. Unreal, eh? If you wanna see for yourselves, go take a gander. I'm hiding behind No. 3. Clickety click HERE. Thank you. Thank you very much. CNN? Nice work. That's high rollin'. I semi-doubted your celebrity status before, but now there's no question in my mind. Dainon! You're famous! I love it. Good job Elvis. I prefer the Santa Elvis and you know why, but that is so cool you got national coverage for being the King. Keep it up you hunka hunka burnin' love. Cool. How did CNN find you? Or did you find them? They had a site where you could upload your Elvis experiences via words, photos or videos. I sent a few photos and they were on it ... flies on flypaper. The rest is, as they say, history. OMG! I had no idea.